President Obama greets members of Congress as he arrives in the House chamber in the U.S. Capitol to deliver his State of the Union address on Tuesday. State of the Union addresses, by their nature, combine lofty rhetoric, bold claims and policy proposals that stand little chance of becoming law. But underlying all the hyperbole are, or at least should be, facts. My FiveThirtyEight colleagues and I watched President Obama’s address and are here to provide a bit of context for some of the key passages (quotes are taken from the speech text as prepared for delivery). Pretty much any way you measure it, the economy is in the best shape it’s been since Obama took office. Of course, that isn’t saying much: Obama took over amid the worst recession since the Great Depression and has overseen a recovery that is by most measures the weakest since World War II. No matter the benchmark, though, three things are clearly true: First, this recovery has been discouragingly slow, particularly by historical standards. Second, it has gained steam in the past year. And third, it has not yet reached a significant percentage of Americans. 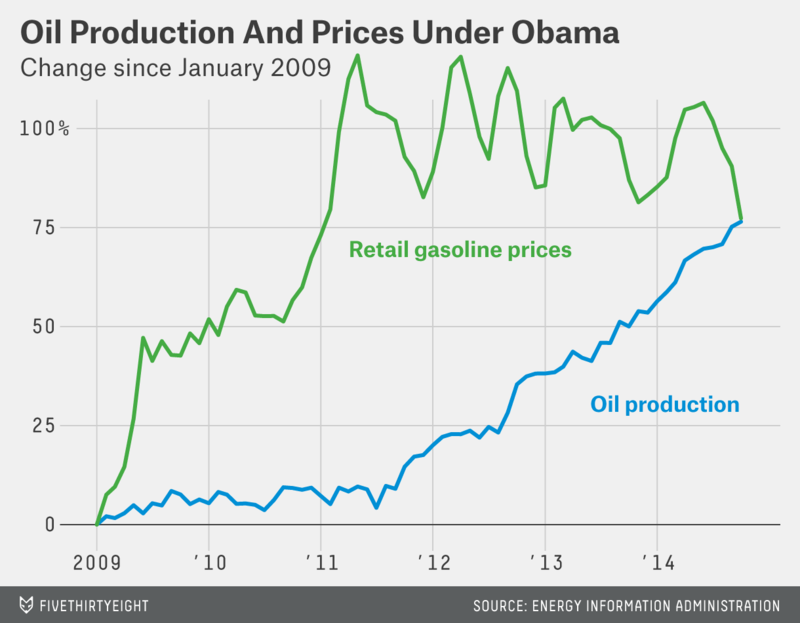 Obama loves to tout the oil boom that’s occurred on his watch. Republicans love to criticize him for standing in its way. It’s hard to give either argument much credence. This much is clear: U.S. oil production has undergone a remarkable resurgence during Obama’s term in office. In 2008, the year Obama was elected, U.S. oil fields pumped 5 million barrels of crude a day on average, the lowest rate since the 1940s. Last year (through October), the U.S. pumped 8.6 million barrels a day, a more than 70 percent increase. The production boom is a big part of the reason why gasoline prices have plunged below $2 a gallon in much of the country. But it’s hard to argue that Obama deserves much of the credit for that. The seeds for the boom (improvements in drilling technology, high energy prices, easy money from Wall Street) were sown well before Obama took office. Moreover, federal lands haven’t experienced the same production boom as private lands and offshore production has declined, in part due to the temporary drilling moratorium the administration imposed after the Deepwater Horizon disaster in the Gulf of Mexico. 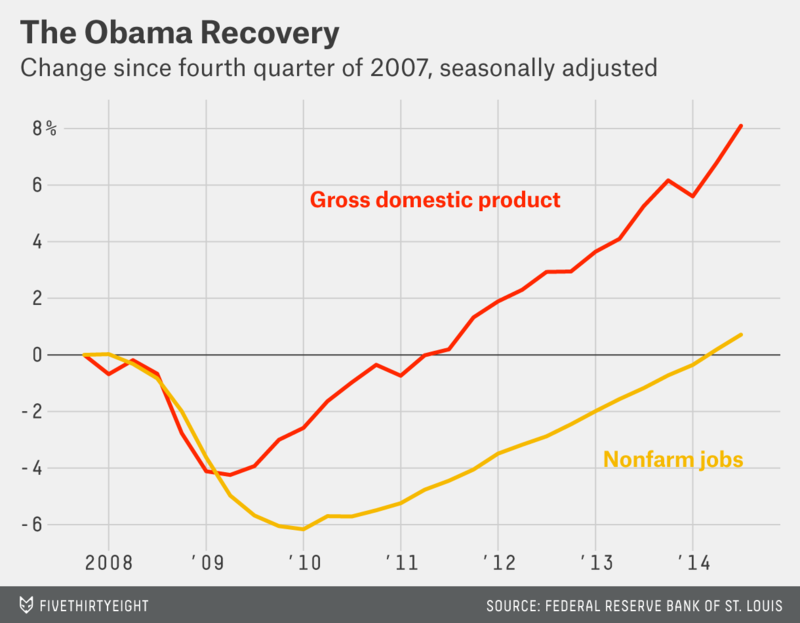 On the other hand, it’s equally hard to argue that Obama has done much to slow the boom down. The administration has resisted pressure from environmental groups to regulate hydraulic fracturing, and Obama’s current energy secretary, Ernest Moniz, has been a fairly outspoken defender of the technique. If anything is holding back drilling, it’s falling prices, not administration policies. Today, thanks to a growing economy, the recovery is touching more and more lives. Wages are finally starting to rise again. We know that more small business owners plan to raise their employees’ pay than at any time since 2007. But here’s the thing — those of us here tonight, we need to set our sights higher than just making sure government doesn’t halt the progress we’re making. 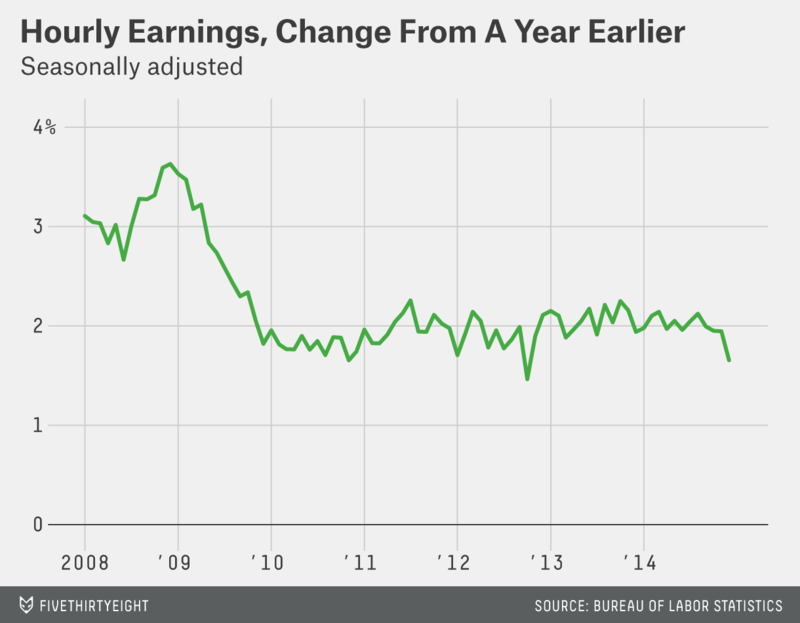 There are lots of reasons to think wages will start to rise sometime soon. But there’s little evidence it’s happening yet. Wages actually fell in December, and while that may have been a statistical fluke, the trend of stagnation has been a consistent theme of the recovery. Obama’s proposals, however, speak to a deeper fear that a strong recovery alone won’t be enough to drive up wages for most workers. There’s reason for that concern. The mid-2000s were a good period for the American economy in many ways — low unemployment, strong GDP growth, a booming stock market — but they weren’t great years for household incomes, which were basically flatbetween 2000 and 2006. Economists are full of theories about why that was — globalization, automation, regulation and plenty more — but almost every theory suggests the need for policy changes that go beyond just promoting economic growth. Obama’s proposals suggest he’s been influenced by his former top economic adviser, Lawrence Summers, who co-wrote a new report on promoting “inclusive prosperity” for the Center for American Progress, a left-leaning think tank. Many of the reports’ proposed changes in tax, regulatory and spending policy were echoed in the State of the Union address. Here’s another example. Today, we’re the only advanced country on Earth that doesn’t guarantee paid sick leave or paid maternity leave to our workers. Forty-three million workers have no paid sick leave. Forty-three million. Think about that. And that forces too many parents to make the gut-wrenching choice between a paycheck and a sick kid at home. 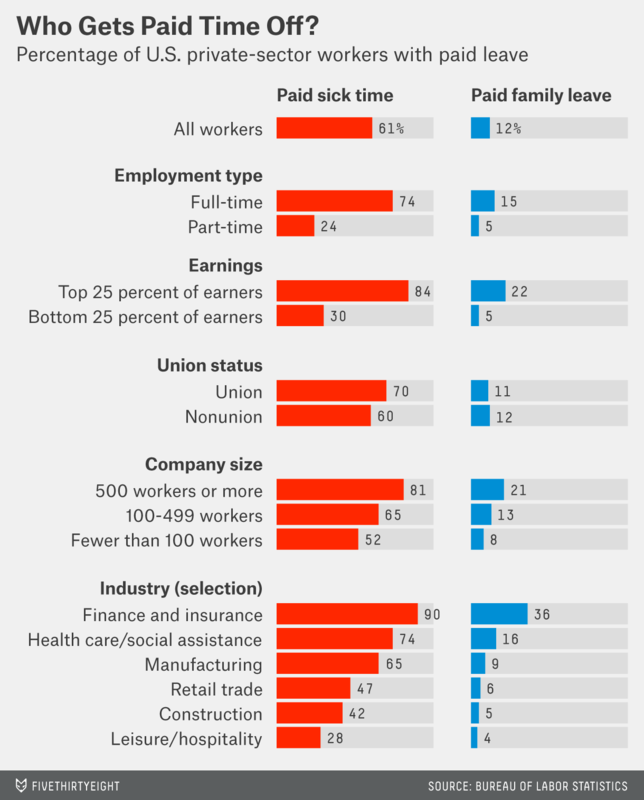 As I noted last week, very few American workers get paid time off when they become parents, and a significant minority don’t get paid sick days either. Perhaps unsurprisingly, there are big variations by occupation and income. Nearly three-quarters of full-time workers get paid sick time, for example, versus less than a quarter of part-timers. Obama spent a lot less time talking about manufacturing in this year’s speech than he has in past addresses. That probably isn’t coincidental. Obama’s promised “renaissance in American manufacturing” has largely failed to take place. In terms of output, American factories are back to where they were before the recession, but that’s about it. In terms of jobs, the situation is far worse: Manufacturing employment is 1.5 million jobs below its prerecession level and more than 300,000 jobs below where it was when Obama took office. 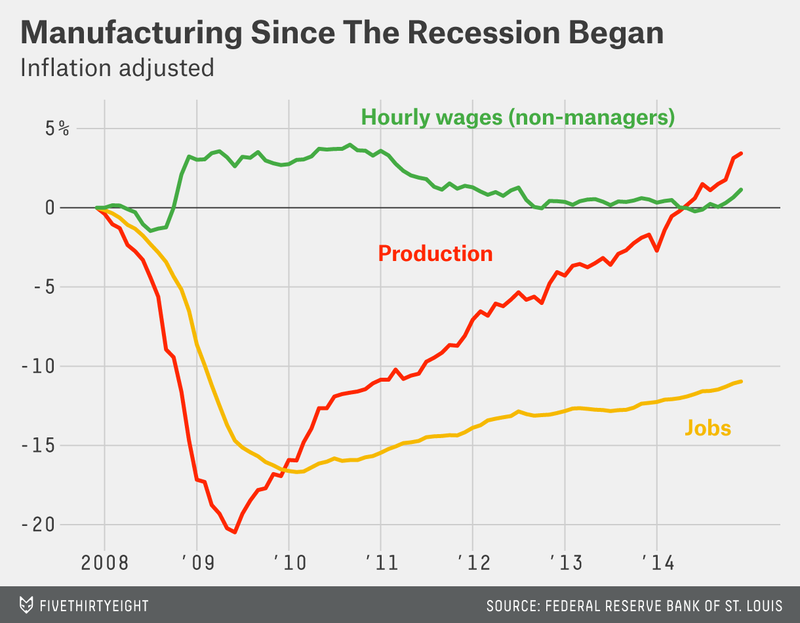 And though manufacturing employment is rising, its rebound has been slower than the economy’s as a whole. What’s more, the factory jobs being created today pay less than they used to: Inflation-adjusted manufacturing wages are down about 2 percent since Obama took office. Obama also hasn’t been able to deliver on a related pledge, made in his 2010 State of the Union address, to double U.S. exports by this year. He didn’t even come close, although a weakening global economy and a strengthening dollar deserve part of the blame. And let’s close the loopholes that lead to inequality by allowing the top one percent to avoid paying taxes on their accumulated wealth. We can use that money to help more families pay for childcare and send their kids to college. We need a tax code that truly helps working Americans trying to get a leg up in the new economy, and we can achieve that together. As my colleague Andrew Flowers wrote Tuesday, Obama is proposing raising taxes on capital gains. There’s a simple reason he’s focusing on that issue: It’s where income inequality is starkest. Most Americans get next to none of their income from capital gains (earnings from the sale of an investment, such as a stock, bond or piece of real estate). 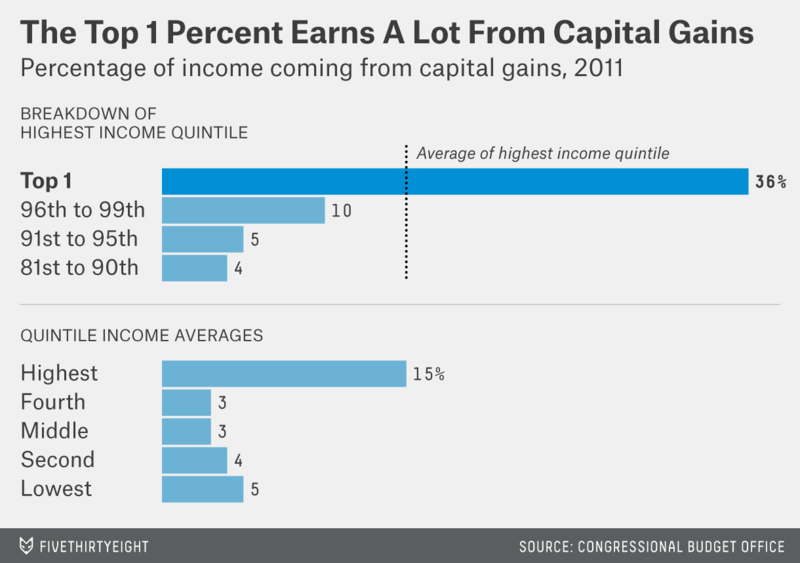 But capital gains account for more than a third of the income of the wealthiest 1 percent. Obama is particularly focused on a subset of capital gains: those passed on to heirs after death. Right now, if I buy an asset for $100 and sell it for $120, I pay taxes on the $20 increase in value (the capital gain). But if I buy an asset for $100 and leave it to my (fictional) daughter, she won’t owe taxes on any increase in value from before my death. For tax purposes, it’s as if she bought it for whatever it was worth when I died. It’s a technical point but an important one: According to a Treasury Department analysis, the existing policy will cost $63 billion in 2015. Obama wants to change the law so heirs owe taxes on inherited capital gains, although with broad exemptions for middle-class families. Much of the political commentary around immigration focuses on how the issue affects the Latino vote, which was important to Obama’s victory in 2012 and could play a key role in the 2016 presidential race as well. But it’s worth remembering that immigration has changed drastically over the past 10 years — far more, in fact, than the immigration debate. 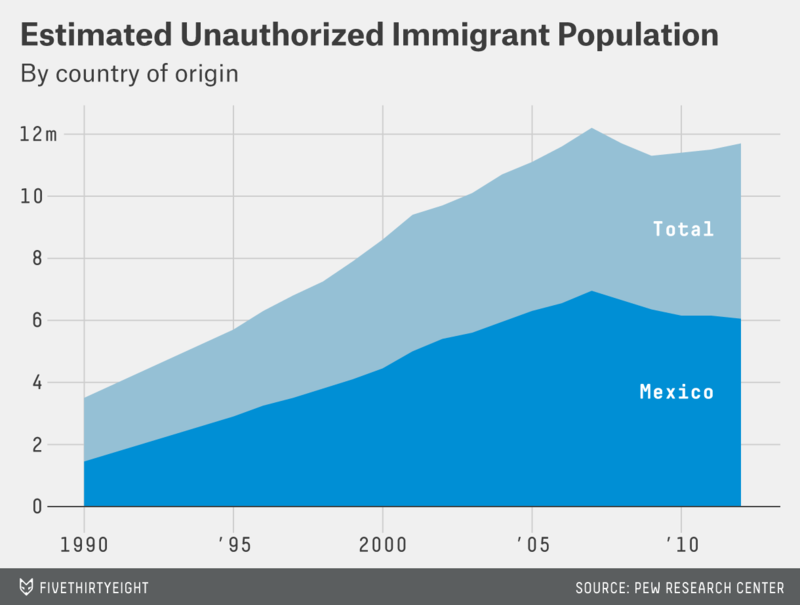 A majority of new immigrants come from Asia, not Latin America, and illegal immigration is well below its mid-2000s peak. 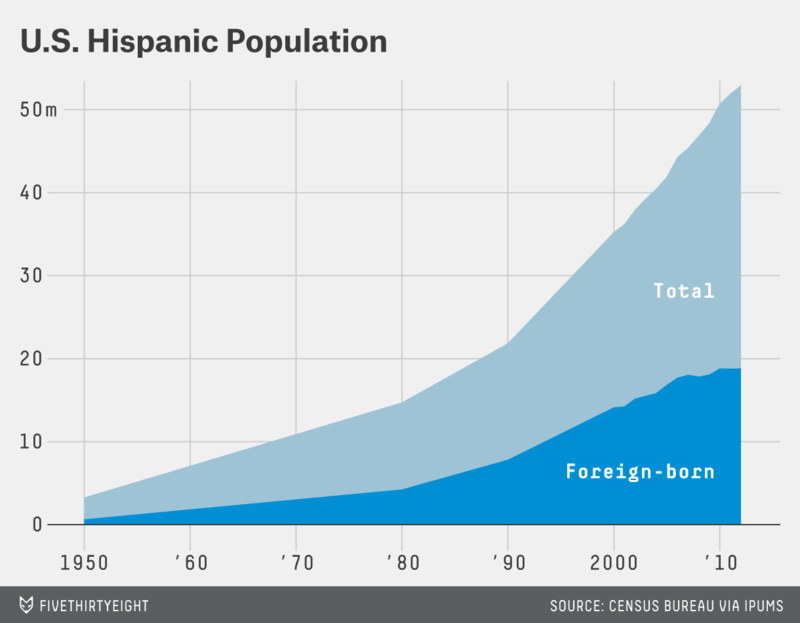 Meanwhile, the Latino population is changing, too. Most U.S. Hispanics were born in this country, and their population growth is being driven by native births, not immigration. And in the past year alone, about ten million uninsured Americans finally gained the security of health coverage. Despite early technical woes and political threats, enrollment under the Affordable Care Act (ACA) has largely been a success story. More than 6.8 million people had enrolled or re-enrolled in health insurance on ACA-created marketplaces as of Jan. 9, according to Health and Human Services. This puts enrollment on track to meet the government’s target of 9.1 million by the closing of the current open-enrollment period on Feb. 15 (Obama is counting Medicaid in the 10 million figure quoted above). We can’t put the security of families at risk by taking away their health insurances. So let’s set our sights higher than a single oil pipeline. The fight brewing in Congress over the Keystone XL pipeline (that’s what Obama, very obliquely, was referring to) grew fiercer this week, as the new Republican majority worked to push through legislation to approve the oil pipeline, while Democrats proposed amendments to the bill that would, among other things, require the pipeline’s construction to rely solely on U.S. steel and to prevent export of oil transported by the pipeline. Environmental groups have spent years trying to block the pipeline in hopes of stopping the extraction of Canadian tar sands, a particularly carbon-intensive source of oil. (A recent scientific report calculated that 99 percent of Canadian oil sands must be left untapped if we’re to meet climate goals.) Meanwhile, Republicans and some Democrats from states whose economies rely on oil revenues have argued that Keystone will bring much-needed jobs and promote energy independence. I urge this Congress to finally pass the legislation we need to better meet the evolving threat of cyber-attacks. From the data breach at Target stores just before Christmas 2013 to the attacks on Sony Pictures Entertainment about a year later, high-profile hacks have brought public attention to cybersecurity. Just last week, as Obama was pushing cybersecurity legislation, Islamic State sympathizers hacked the U.S. Central Command’s Twitter account. CORRECTION (Jan. 21, 12:06 a.m.): A previous version of this article said Larry Summers was Obama’s treasury secretary. He served as treasury secretary under President Bill Clinton and as director of the National Economic Council under Obama.